My name is James O’Donnell director at M O’Brien. 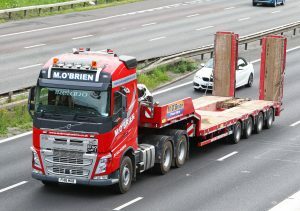 M O’Brien specialises in Specialist Plant Movements and various other activities across London and the South East. As we operate in the most congested area of the UK we are mindful of the difference we can make and always aim above the basic requirements. We were asked to consider FORS in 2015 along with our sister company Ashvale Haulage, after seeing more and more companies proudly displaying their accreditation, we decided in 2016 to go for Bronze and work toward Silver this year 2018. The work we carry out and the sites we deliver to make it impossible to consider other modes of transport. Having said, that we are extremely conscious of our impact on the environment and are constantly looking for ways to reduce the damage we are responsible for. At M O’Brien we pride ourselves on ensuring our fleet is as up to date as possible, has the EURO 6 Engines in operation and is as close to Hybrid Efficiency as possible. We pride ourselves on having an efficient management team within maintaining strict adherence to manage every aspect of its business, compliance and ongoing monitoring of its fleet. With plans going forward to support smaller companies in their FORS Journey and a progression through the Practitioner Modules for all our team we are doing everything we can to be as proactive as humanly possible. 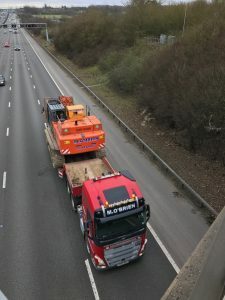 To Conclude, FORS has supported M O’Brien to act quickly, efficiently and effectively to implement the correct practices to ensure the fleet continues to operate as safely as possible. We have ensured there is a framework of type that ensures compliance at all levels of the business to be up to date on every aspect of our role in the industry. Essentially we now have access to all the tools such as training courses and Elearning that would not be available to us without FORS and I doubt we would seen the benefits without it.